Preheat oven to BROIL and line a cookie sheet with aluminum foil. Spray aluminum foil with cooking spray. Place Fiber One™ in a food processor or blender and process until fine crumbs. Add Parmesan cheese, Cajun seasoning, onion powder, garlic powder, and Italian seasonings and pulse once more. Coat tilapia in egg white and then coat in crumbs. Place on prepared cookie sheet and spray top of tilapia with cooking spray. Broil for 3-4 minutes then turn fillets over and broil for another 3-4 minutes or until done. Squeeze one lemon slice over each fillet and enjoy. Searching for a white fish that actually has some flavor? Try dialing it up with this seasoned coating made from Fiber One cereal! I’ve never believed in fad diets, but out of desperation last year I tried one where all I could eat was plain white fish or chicken for over a month, along with some veggies. It was great to be eating healthy and losing weight but I ate so much tilapia that I swore it off for awhile once the diet was over. Now that it’s been over a year since the diet, I can finally look at tilapia again. It’s one of my favorite fishes, and a mild one at that for those of you who don’t like fish. But I didn’t want to just eat it plain; I wanted to find an exciting way to prepare it that actually had flavor. This Fiber One Tilapia is a moist flaky fish with a crispy seasoned breading made from … you guessed it, Fiber One cereal. The seasonings add a ton of flavor and the Fiber One adds a crunchy breading along with the fiber we all need. Just throw some Fiber One cereal and seasonings into a food processor or blender and process the cereal until fine. My family had no idea that it wasn’t just regular breadcrumbs. Coat the tilapia in the crumbs then broil for a couple of minutes on each side. 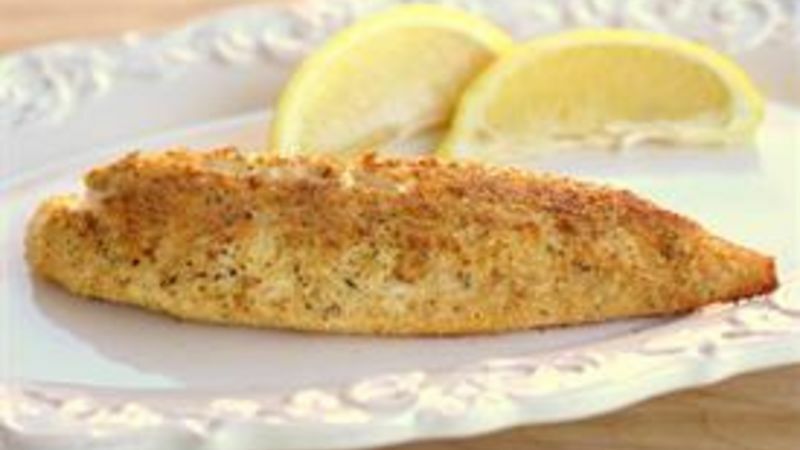 Squeeze some lemon on the cooked fillets and you have a healthy meal in under 20 minutes. If you like the idea of adding fiber to your recipes, try these!